How respectable are comics, really? Comic book movies attract millions of people to cinemas. But what level of respect do these characters in costume receive? Yes, they are a respectable character archetype. It’s not about the money the films garner. The characters have meaning for the audience. We can look up to their example, if we want. But others might argue that a man or woman lifting a car overhead, wearing bright colours, is disrespectful. Childish, and meaningless: a shallow stories punctuated with special-effects. For situations where the criticism is negative in the extreme, there are several valid replies. 1. Comics cross generations. Comics are stories that have the Same impact to an 80 year old as an 8 year old. You might here someone say, or imply, that comics are for children. Comics connect with people of any age, or at least have the potential to reach people of any age. And media that unites generations is valuable. 2. Comics show ideas Of justice. Abstract concepts like justice become concrete and meaningful in comics. Justice can be abstract. Abstract concepts are difficult to understand. A well researched and pitched comic story can act out and demonstrate abstract justice. They make justice concrete. And concrete concepts are easier to grasp. 3. Comics speak out against oppression. Many different productions – novels, TV, and theatre- speak out against oppression. But comic books have gained a large platform. With that platform, they can speak out against oppression. Comics have supported the disenfranchised for decades, going back to the stories of Marvel’s X-men in the 1980’s. Of course, no media is free of problematic issues. Some comics arguably maintain oppression. This point falls beyond this article’s scope, but is a fair point worth discussion. 4. They show us that caring about values and communities is fun. Comics such as Ms.Marvel tell stories about thriving communities. Super Heroes in comics can care about their community. Comics tell stories that represent core values (humility, compassion, empathy) in a fun and engaging, playful way. 5. 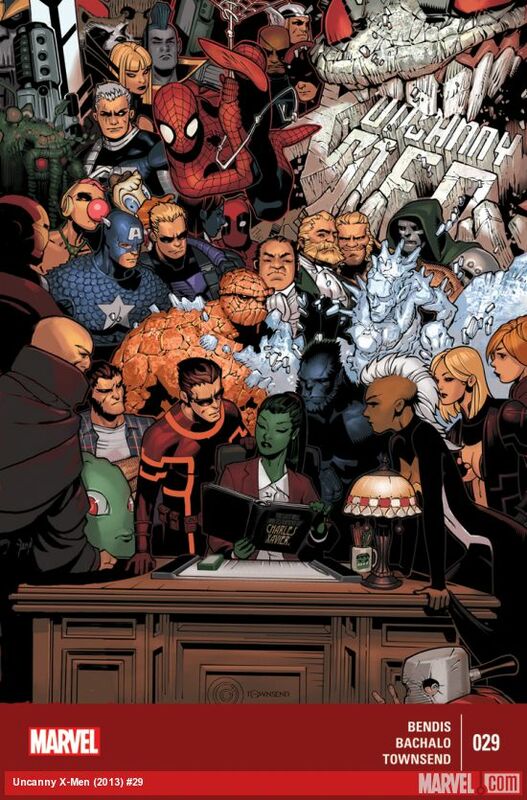 Superheroes in comics embody Communities. We follow their journeys, and gain a modicum of empathy. By representing diverse communities more and more, audiences gain an insights. They get to know other people, and other communities we are not familiar with. Like argument number 3 above, other media can achieve this. Comics combine words and pictures, however. They can give insight in a unique and engaging way not found in other media. These arguments were gathered from a talk held at the Gallery of Modern Art (GOMA) on super heroes and the real world, which I wrote about in a previous post. For more comics content on the Wallflyer and you can follow me, Joe, on twitter @thewallflyer. Tony Stark recommended that Flash Thompson – a soldier currently wearing the alien Venom symbiote – join the Guardians of the Galaxy. Possibly, Stark believed the alien should be sent back to space where it came from. Venom’s character design changes several times during this comic, and is suitably alien. At one stage, the symbiote can compare to Big Chill, an alien from Ben Ten. Art choices for the appearance of Venom in this comic book are suitably for science fiction. This is because the hood and cloak design Venom shows off when stalking Kree on the Planet Spartax looks alien. It resembles Big Chill from the Cartoon Network animated series Ben Ten. Both Venom in this comic and Big Chill wrap moth-like wings around themselves, which creates a cloak and cowl look. Later, fight scene between Gamora and Venom showcase good choices of background colour and inking. Lines drastically add to the flow of action, as the pencilling renders Gamora’s acrobatic skills in avoiding the Symbiotes’ flurry of strikes. Venom’s appearance shifts again here, becoming even more like an insect for a moment. Venom and Flash Thompson conflict over control, while Star Lord and Kitty Pryde’s continue their new, long-distance relationship. Rage and violence dominate Venom’s behaviour, while Drax the Destroyer has quiet, but similarly violent moments. Flash Thompson moans that he was not in control of the Symbiotic alien Venom. He can control it on Earth, he argues. Alongside this central conflict rests Peter Quill and Kitty Pryde’s new relationship, in which Peter struggles to control his behaviour. Rage is common for him. Thompson screeches in angry, short outbursts. He violently dispatches with aliens who cross his path, or cannot give him what he wants: a way back to Earth. Drax the Destroyer does not have more than a few lines in the comic book, but does stage a lengthy, violent battle with an alien beast. Control appears often in this comic. Venom and Flash Thompson form the centre of this theme since Thompson constantly struggles for control with the alien symbiote . Parallel to their relationship is an altogether different one, between Star Lord and Kitty Pryde. Star Lord makes a point to Pryde that he is controlling his past reactions to high stress and changing. The comic is largely about control. 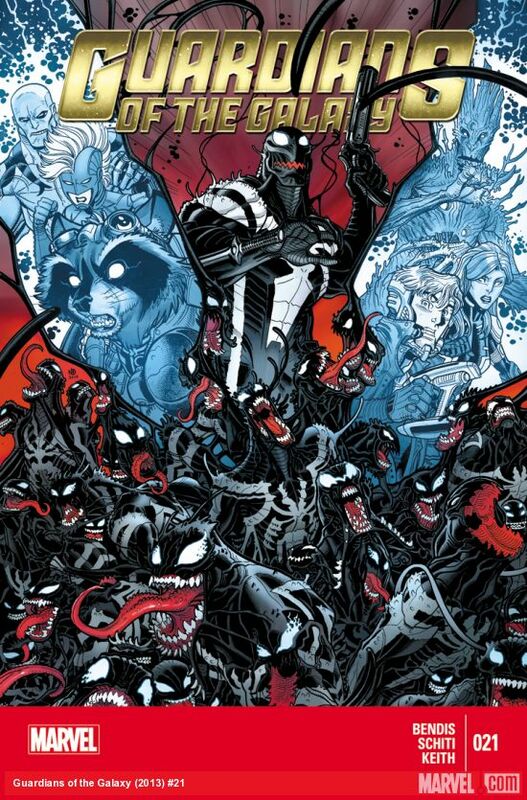 In Flash Thompson and Venom’s struggle, control between the symbiote and the host is a clear. The conflict represents the struggles with addictions and compulsions. Violence and drinking appear in the comic, with scenes in a bar on the planet Spartax. Placing Venom with the Guardians of the Galaxy – a team know for their disfuctions, as Star Lord states when speaking with Kitty Pryde – highlights struggles with control and compulsions. Starlord does not wish to fall back into habits he relied on to relieve tension and stress in the past. Instead, he talks to Kitty. Later, after the confrontation between Gamora and Venom, the Guardians discuss what to do with Thompson and the Symbiote. Star Lord says that like the Guardians, the Symbiote is “broken”. It’s not completely clear, since calling something dysfunctional broken is not specific, however Star Lord has observed that Thompson’s weaknesses and compulsions are difficult to handle in day-to-day life, just like his own, which he discussed with Kitty Pryde earlier in the comic. The Guardians believe they can help Thompson regain control by taking him back to Earth, where he has more friends and support, and feels safe. A space-propaganda message about the dangers of heroes and Terrans from Earth. The message delivers a more chilling call to destroy Earth, rather than simply control or corral humans from spreading out into the wider-galaxy. Whether this conflict expands into a larger plot thread remains to be seen. Guardians of the Galaxy #21 is published by Marvel comics ($3.99 USD). Brian Michael Bendis (W.) Valerio Schiti (A.) Jason Keith (C.) VC’s Cory Petit (L.) Cover artwork by Schiti and Ponsor. Throughout this comic, artwork is cinematic. Moment to moment transitions are expertly rendered. watching each panel progress the story feels like watching a moving image. Wolverine acts on instinct. Only small internal dialogue boxes appear. This design choice keeps the artwork flying through to the conclusion. Another strong artwork choice manipulates time. Wolverine steps into a room, and sees the space as he knew it decades ago. The page artwork, a memory, is saturated in peach light. Turning the page warps the reader to the present day. Everything is in the same place as it was in Wolverine’s memory: only decades have passed. The light is now cold blue. A man standing behind a console has aged, his beard now white when it was once brown. Age, time passing, and milestones that mark the passing of time, are a key theme of this comic. In setting chosen for Wolverine’s final appearance is Paradise Valley, Nevada. Monolithic stone mesas standing in the red sand for thousands of years are literally milestones. 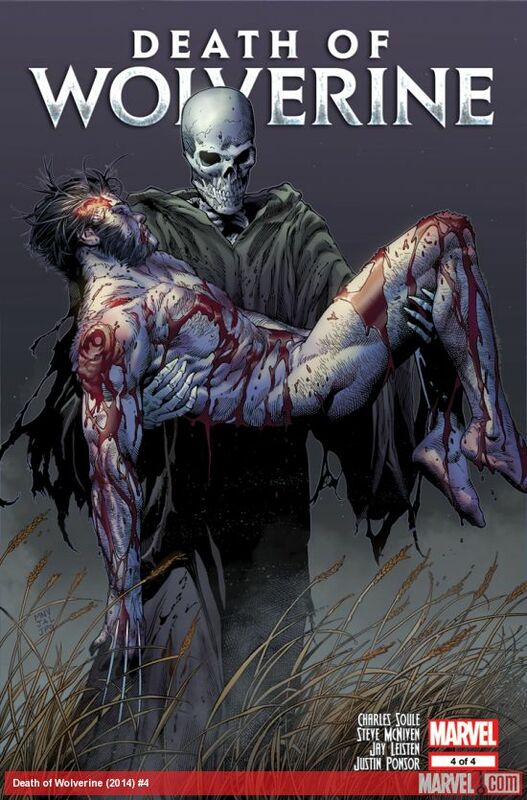 It’s fitting that Wolverine, a milestone in the Marvel Universe and popular culture, receives his ending, interred and laid to rest, here. The core character conflict introduces Frankenstein themes. The villain of the comic brings scientific information into the core conflict. The confrontation that marks out the action in this comic is between a scientist and his creation. Another tie back to Frankenstein themes. A now elderly scientist associated with the military program that created Wolverine wants to correct his mistakes at all costs. Without spoiling the characters identity, the confrontation provides some insights into the Wolverine. Scientific information appears; mammalian taxonomy – sometimes called “latin names” – the binomial names for living creatures appear at the centre of the core character conflict. A wolverine is called Gulo Gulo. This is Latin for Gluttonous Glutton. Wolverine’s have insatiable appetites and is apparently the only animal that “kills for pleasure”. The scientist criticise Wolverine, and tries to take one last swipe at his confidence. The villain’s plan is horrific. It’s worth pointing out these scenes contain semi-graphic surgery artwork. A bright sunset closes the comic. Panels featuring key moments from Wolverine’s life are placed along the top of a two page artwork. The sunset panel acts as a base. Milestones in Wolverine’s life are laid out here. His time as a soldier in World War Two, His time in Japan, His time at the Jean Grey School. 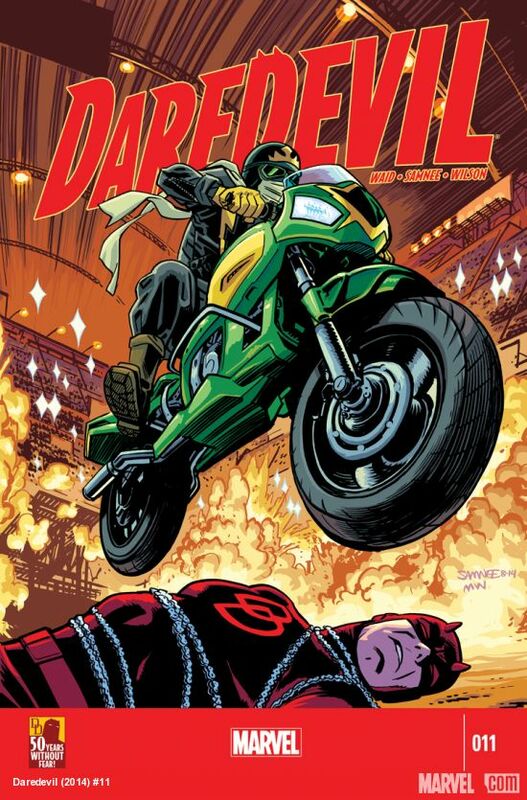 Despite capturing moments in time from across the Marvel Universe, The comic takes place in about an hour or less. Despite such a short amount of time passing, Death of Wolverine #4 manages to show the significance and weight of time and milestones. Wolverine is eventually trapped in a downpour of molten adamantium. Inside the metal, entombed, Wolverine himself is turned into a milestone – a metal monolith. The final pages of the comic contain a gallery of cover artwork collecting the variant covers of all the Death of Wolverine comics. Finally, a page at the end of the comic provides the creators space to reflect on the passing of Wolverine. Death of Wolverine #4 is published by Marvel Comics ($4.99 USD). Charles Soule (W). Steve McNiven (P.) Jay Leisten (I.) 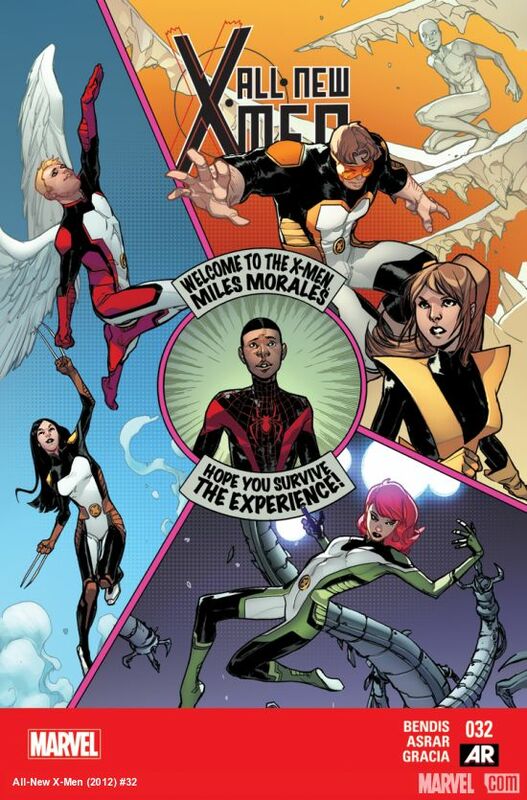 Justin Ponsor (C.) Chris Eliopoulos (L.) Cover artwork by McNiven, Leisten, and Ponsor.